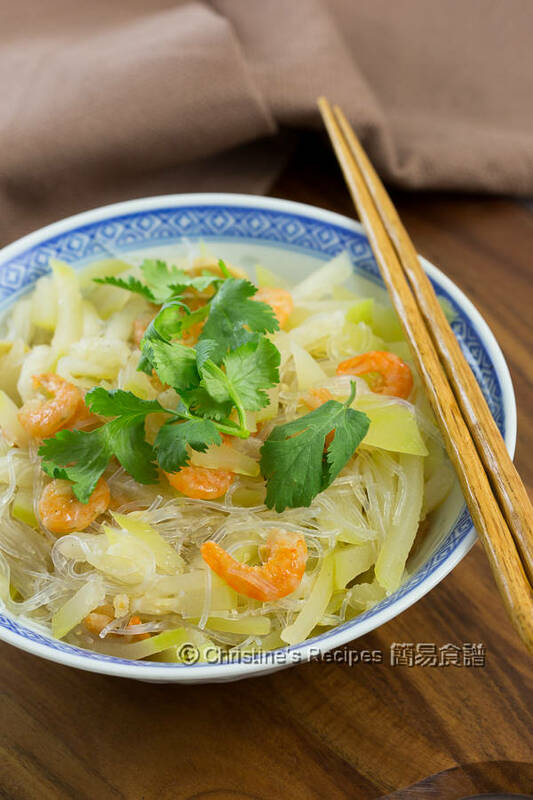 I grew up with this traditional dish, Hairy Gourd, Vermicelli and Dried Shrimps. We used to make this simple, tasty and homey dish in the summertime. It gives you a refreshing feel. It can be served as a main or a side dish. This dish is widely accepted by Hong Kong families as it won’t cost too much. 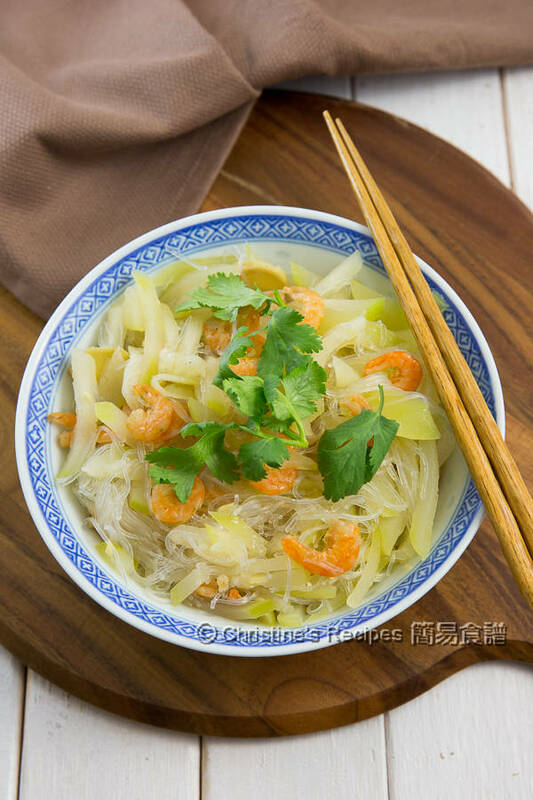 To make this dish, basically, you only need hairy gourd (節瓜), vermicelli (粉絲) and dried shrimps (蝦米). These ingredients are very common that you can easily find them in any Asian grocers. 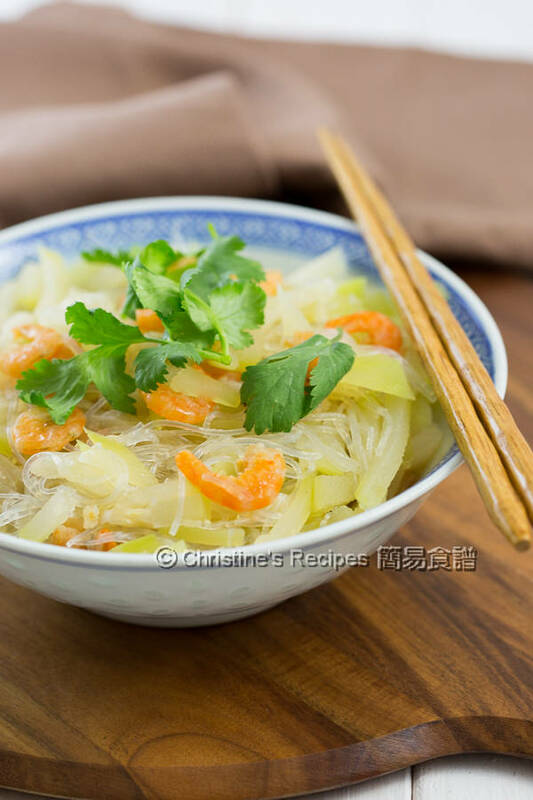 Every family has its own version and method to make this braised hairy gourd dish. My family has a special way to make it. We like cooking them in chicken stock. The stock enhances the tasty flavours. Some people like using the water that soaks dried shrimps to bring in umami taste. So why not use both stock and dried-shrimp soaking water if you like delicious dishes? Rinse the dried shrimps. Soak in the ½ cup of water for about 10 minutes, until they are softened. (Remark: If you find any dirt or vein, you can use a needle to scrap it out. If your dried shrimp are too small, it’s quite difficult to clean them one by one. So try to get quality ones.) Drain out the shrimps when they turn soft. Keep the water for later use. Soak the vermicelli until softened. Don’t soak too long at this stage as you need to cook with other ingredients later. Otherwise, it turns soggy. Drain well. Use a pair of scissors to cut into two or three sections. Discard the water. Peel the hairy gourd. 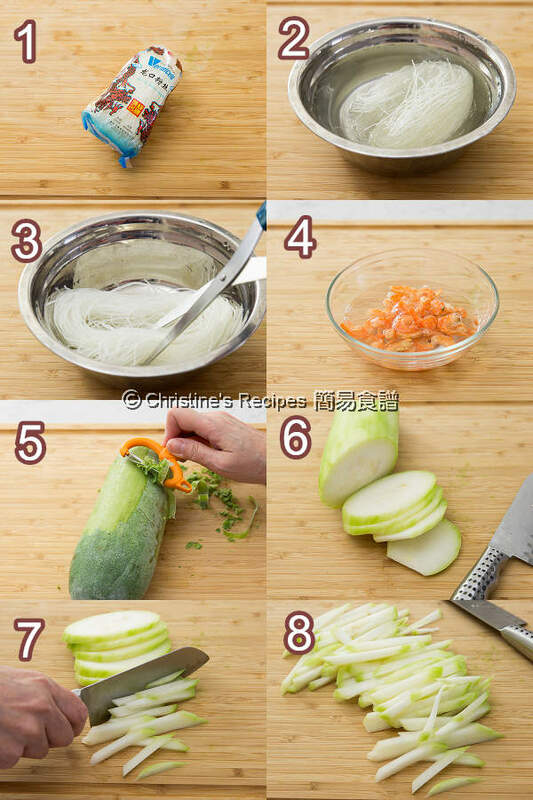 Slice then cut into 5- to 6-cm (2- to 2½-inch) strips. Set aside. Heat oil in a wok over medium-high heat. Saute ginger and dried shrimp. Add hairy gourd. Stir to combine and heat up all the ingredients. Season with salt and sugar. Pour in the chicken stock and the dried-shrimp soaking water. Cover and cook until all ingredients become tender. Add vermicelli. Cook until softened taking up all the sauce. Beware not to let the sauce dry up completely. Add sesame oil. Stir to combine. Serve hot. Garnish with coriander. Try to get quality dried shrimps without shells. Large ones are meaty and better. Good quality dried shrimps are larger without any dirt/veins inside. Vermicelli likes water/sauce. After serving, the vermicelli won’t stop absorbing the sauce. 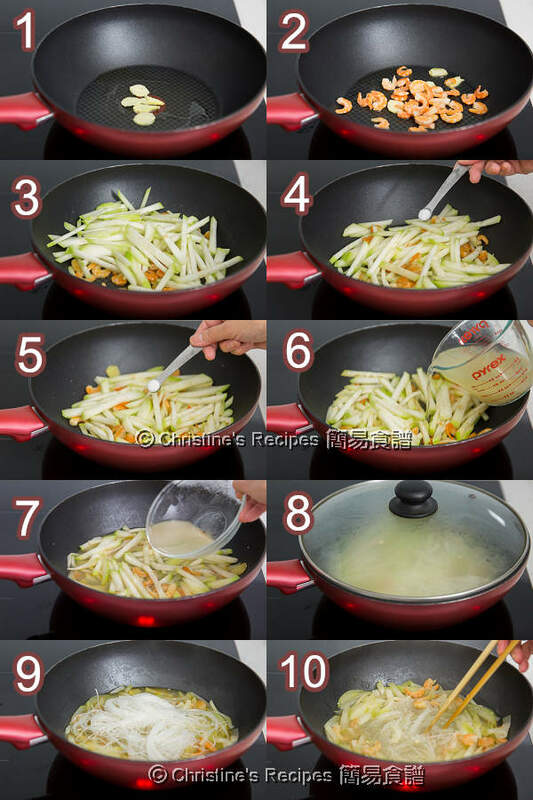 Thus, don’t let it cook too long in a wok as you don’t want your dish to turn to be too dry. There should be some sauce. Light yet very flavourful thanks to the dried shrimps! Love all your dishes! I am Chinese living in Canada for more than 45 years! I share your recipes to my non-Chinese friends. For this particular recipe, I do not a question though, isn't vermicelli rich noodles? I think it is the mung bean (glass) noodles that we're using, right? 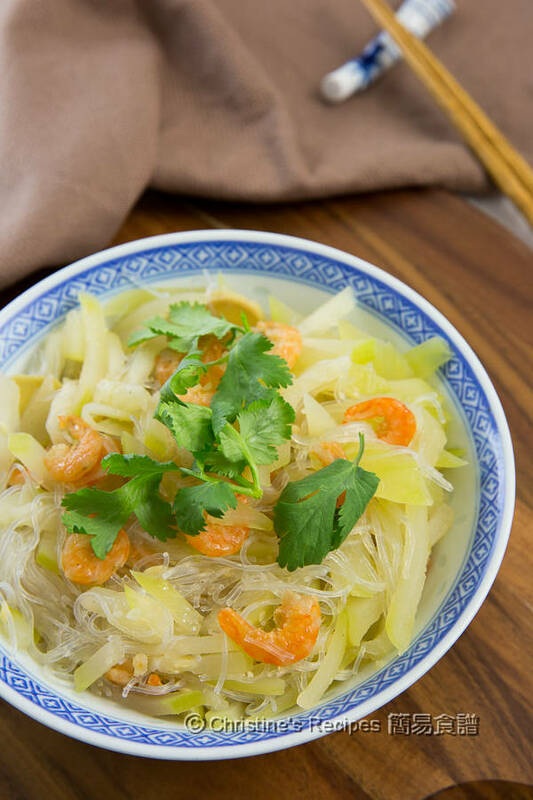 For making this dish, yes, use mung bean (glass) noodles.